Round the corner from the mighty Oaks Tea Room (closed for Easter?) can be found a little acorn of a venue. Yes, this is a library. 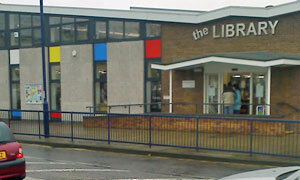 Following its recent-ish revamp, Felixstowe library now plays host to Cafe Libra (see map). See what they've done there? Actually, the refurb was long overdue. See what I did too? Another grotty blowy squally day and it's fair to say that our non-Dickensian expectations weren't great. Maybe they'd have some soggy prepacked plastic bread sarnies, unless they'd already gone. Perhaps a couple of tiny tables at most. Mais non, mes amis: bienvenue a la bibliotheque et assieds-toi. There's cafe-style tables and seating, a sprinkling of comfy red armchairs and, au centre, three flatscreen PCs offering free (!) Interweb access for those in possession of a Suffolk library card. Like me, in fact. I felt obliged to give it a quick try and nearly but not quite wrote this review there & then. All this and, would you Adam & Eve it, the food is freshly made too. Sandwiches, rolls, toasties made to order, and today's special of beans on toast at only £1.50. Nice. Placed our respective orders and grabbed a couple of squishy chairs directly underneath the large Dewey Decimalised plasma telly showing News 24. Unlike Terminal 5, the Librans know what they're doing, and delivered our foodstuffs (toasted corn beef & onion for me) swiftly, presented on branded plates. Get them. Like those Monty Python Yorkshiremen, we were lucky ... to get a seat. Babies and their mums were very much the order of the day, perambulators tucked in every N and C. Had plenty of time for a slab of fruit cake, a 50p bargain, washed down with a really rather good Americano. Comfy, warm, welcoming, Cafe Libra gets The Balance just right. Head on down there next time you're in Felixstowe: no need to book. If it was a car -- Audi A3. If they were passing by -- Louis De Bernieres.